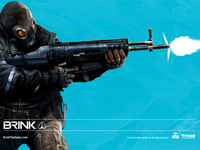 Monday May 9th Bethesda Soft works latest first person shooter, 'Brink' was released. Bethesda is well know for some of the best game titles we loved in the past such as Doom, Quake, Fallout and Wolfinstien. Brink, Bethesda newest FPS is beginning to look pretty promising. Brink is an immersive first-person shooter that blends single-player, co-op, and multiplayer game play into one seamless experience, allowing you to develop your character whether playing alone, with your friends, or against others online. You decide the combat role you want to assume in the world of Brink as you fight to save yourself and mankind’s last refuge. Brink offers a compelling mix of dynamic battlefields, extensive customization options, and an innovative control system that will keep you coming back for more. Some of the customizations that include designing your own player’s body build and appearance are factored into its performance ability. For example, the larger the body the stronger it may be however he can also be slower and less agile. The weapons and controls are nothing to new. Some people might find this easier to get into the game. But I think this really comes down to personal choice. The game host single player campaign, co-op and Multi-player with up to 16 players at a time. Sorry to say, this game won’t offer you a mosh pit if that is what you’re expecting. Other development includes “play Smart” which gives you intelligence and direction to help you complete a mission. The game does have the feel of other FPS like Kill Zone and Call of Duty with nothing incredibly new or unseen. For FPS fans I would say this is worth getting. Bethesda so far has done a pretty good job on developing games we like with an original look and feel. It is to early to tell if this will be a huge success but I don’t think FPS fans will be let down.